Tool Blog News Cadex CPB23.50 23 gauge pin nailer. Only a few years ago, you would have one heck of a time trying to find a 23 gauge pin nailer. Now you can find one at just about any quality tool store. In just the past few years the quality and features of pinners has really shot up, going from a max length of 1 3/16" to now 2". This has a lot to do with the popularity of the Grex line. It really kind of amazing that a gun can shoot such a nail. 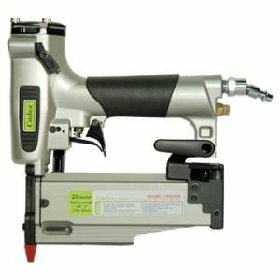 Is it possible that the 23 gauge will replace the 18 brad nailer? Probably not, but Cadex doesn't seem to care. Cadex now has a gun that will shoot both headless and slight headed 2" 23 gauge pins. The Cadex CPB23.50 . This means greater holding power, with still the very small hole of a 23 gauge nail. The price on this gun isn't cheap, at $300, but it is still around $40 less then the Grex counterpart. Now I have used Grex pinners in the past, and know they make quality tools, so I wonder how the two would compare. The only difference I can see, is the ability of this gun to shoot the headed nail, but it only goes down to 5/8" where the Grex 650 will go as low as 1/2". For me the headed feature far outweighs the lack of its ability shoot an 1/8" smaller nail. With my Grex copycat on its last limb, this might just be my next toy gun. Dimensions L x W x H: 9-3/16" x 2-3/8" x 8-7/8"